Linking up for January with Emily and Kylie for My Favorite Things! Over the holiday, I got a lot of new beauty items (some purchased / some given as gifts) and so far I am loving everything! These are so adorable! She has all the Zodiac signs, and I choose to also add my birthstone (everything comes in either silver or gold). This was a Christmas gift I asked for...I have the Naked 1 and have used it a ton over the past year, so I thought it would definitely be worth it to have another. I liked the look of the shades better in 2 instead of 3 (I don't look good in rose-shades), so that's why I picked this one over the newest release. Honestly, I have literally used this everyday since Christmas! You can easily do a day or night eye with the perfectly pigmented and silky shadows. The Naked 2 on top, Naked 1 on bottom. It has made my skin feel cleaner and softer than it has in years. You can never have too many lotions, face and body washes! I love the Neutrogena Pink Grapefruit line, but I'm most excited about trying the Lush face scrub and Aveeno Lavender products - lavender is one of my favorite scents! These all came as free gifts / bonus items with a clothing order I placed recently. I'm excited to try out all the sample size perfumes! I know I love Dream Angels Heavenly, Bombshell, and Noir Tease...but this has 3 others for me to try too. Will you be linking up for January favorites?? I always love reading everyones different posts! I LOVE my Clarisonic, especially in the winter. I feel like it does such a good job of buffing away all of the dry skin and gives me more of a glow. I need to check out that perfume sampler too! Victoria's Secret is always coming out with new ones, so it's hard for me to keep up. I'm using a skin brush similar to the clarisonic but it's by mary kay, and I felt the same way! I keep thinking, "how in the world did I use my hands to wash my face before????" I'm a new follower by the way :) Excited to read more from you in the future! I have been dying to get a naked pallet! I really like the second one also! I just need to bite the bullet and get one! 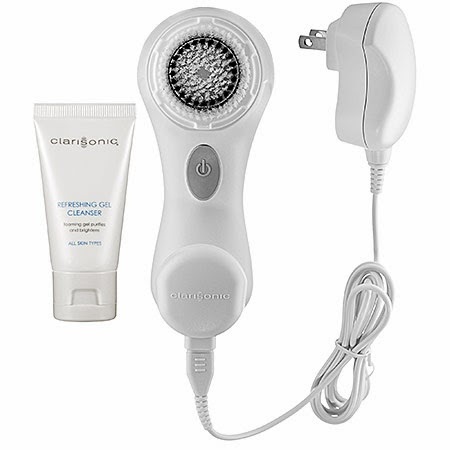 I am obsessed with my clarisonic! I seriously cannot go to bed without using it! It's my #1 beauty product must have! Thanks for sharing your favorite things with us! Love your pretty necklace! And I love my clarisonic too! I need to bite the bullet and order that eyeshadow - it looks perfect. Great goodies! Oh my gosh I love all of the things you got! Cashmere glow is the best smell ever. And I have hear awesome reviews about the Mia. I love urban decays eye shadows! Such a great gift idea! congrats on your naked 2 palette! :) i just ordered the 3rd naked palette, and like you, i dont think rose gold will look very good on me, but well see! it should arrive at my doorstep by the end of the month, hopefully it will look good on me. love the dainty necklace and am super jealous of your naked2!